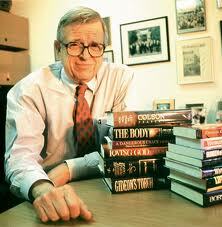 When I first read the other day that Chuck Colson was on his deathbed, I started to tear up. He was a man of God…and to me, maybe even a father in the faith. Colson died April 21st surrounded by his family. After I became a Christian in 1982, Born Again (Colson’s autobiography) was one of my first reads as a new believer. I was getting my bearings in those days, gaping at this Kingdom of God that I could see for the first time, and Colson was one of my tourguides. He had professed Christ 9 years before me, and despite what some in the media had said, it was clear to me that whatever had happened to me had also happened to him. He was the real thing. I remember little of the book, except the basic outlines that you might pick up in any news story, yet it was a delight, and I recall that Colson was impacted by C.S. Lewis’ Mere Christianity. This fact may have been what moved me to pick up that classic. I would eventually pass it on to my dad who would be eternally impacted by the Oxford professor. I followed up Born Again with Life Sentence, Colson’s story of the beginnings of Prison Fellowship. I remember being with the Navs on a trip and the group of us getting an audience with J. Oswald Sanders, author of the classic, Spiritual Leadership. We asked him about his quiet times, and I’ll never forget his answer: He said, “Oh, I could never talk about something so personal.” What a cool answer, huh? I figured you had to be extremely godly to answer the old quiet time question that way. But I digress. Somewhere along the way, I realized that there was more than one way to “walk with the wise”. Sure, seeking out holy men and women had its blessings. But godly people also write books, and I came to believe that reading a book by such a one filled the bill just as well as an afternoon “walking” with him or her. Maybe, in some ways, it was even better. Through the years, therefore, I walked with fruitful missionaries, pastors of great faith, and founders of dynamic Spirit-led movements. And I like to think I have grown wiser as a result. Seven years ago, I started leading a Bible study in one of our local prisons (Waupun has three), affectionately known as “The Walls”. My buddy Pete was moving out of town and asked me to take over. Back then, I don’t recall thinking much about Mr. Colson, but I was glad to pick up where Pete left off, and maybe Chuck Colson was in my head. You see, I never had a single conversation with Nixon’s converted “hatchet-man”, but a long time ago, when my faith was being formed, he talked to me.